The majestic Hilton Universal City is set on 6 1/2 acres, high on a hill above Los Angeles' entertainment district. This gleaming 24-story hotel offers commanding views of the Hollywood hillsides, San Fernando Valley and Universal Studios. Directly across from the main entrance of Universal Studios Hollywood and the CityWalk Entertainment Complex. 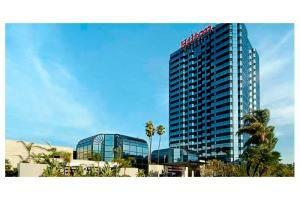 The Hilton Los Angeles/Universal City is located in the heart of the "Entertainment District" of Los Angeles. Cafe Sierra, an on-site restaurant offers Chinese, continental and California cuisine in a light and breezy setting. Nearby attractions include Hollywood, Universal Studios, Los Angeles Zoo, Griffith Observatory, and Magic Mountain.